The HBR is a bandsaw with up to 6 lanes that is designed to Re-Rip defects from fingerjoint blocks. Designed and manufactured by Rose Machinery Inc. New HBR saw sales are made exclusively through Production Machinery Inc. Delivery is usually 12 weeks ARO, but due to production schedules and individual batch progress, it can fluctuate. Designed to take advantage of the ‘straight through feed design’ of the HBR, the outfeed sort system keeps blocks sorted by size while conveying them to boxes or tables which are placed between the supporting legs. 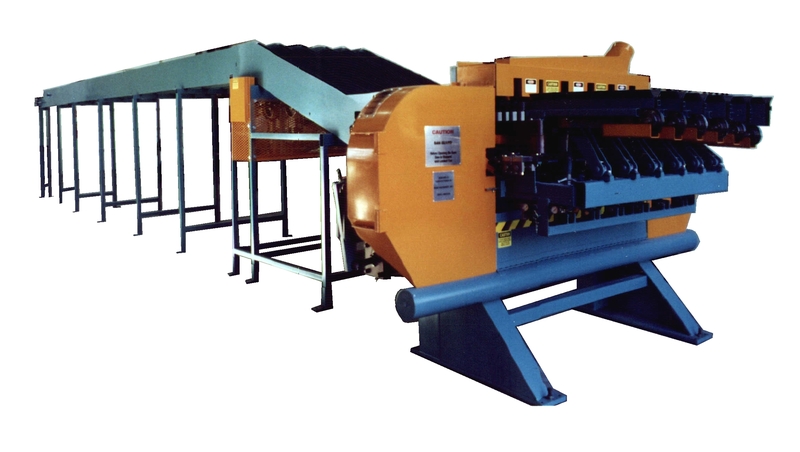 The sorter consists of individual slot belt conveyors (one for each lane) that can be designed to discharge all on the right (above), all on the left, or half right and half left. To see drawings of a HBR installation, visit ourMachinery Layout Page.